LUFKIN, TX – Texas Forestry Association (TFA) announced two sessions for Phase 1 of Teacher Conservation Institute (TCI) will be held this year beginning July 10, 2016, at BugScuffle Inn near Henderson, Texas. 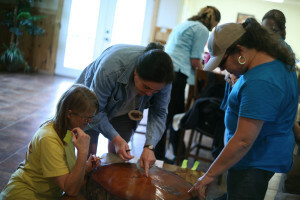 TCI is a week-long workshop held in East Texas which uses the forest to teach environmental education. Activities are led by foresters, educators, natural resource conservationists and industry professionals. Phase I, A Complete Natural Resource Cycle, will run July10-15 and July 17-22 and will consist of interdisciplinary workshops focusing on the environmental, economic, and social well-being of the state that comes through the scientific stewardship of its natural resources. Sessions take place indoors, in the forest, and on a variety of field trips. Elementary, middle school, and secondary teachers participate in field trips together. Teachers are divided into grade level groups for afternoon curriculum sessions. Just a few of the sessions include Tree Trails, GreenSchools Investigations, Project Learning Tree, evening natural history programs, and morning nature walks. Field trips for Phase I include Forest Nursery, Logging Operations, Sawmill, and Oriented Strand Board (OSB) Mill, and Texas Forestry Museum. For participating in Phase I, educators receive certification in Project Learning Tree, TEKS Correlations, 45 hours of State Board of Educator Certification (SBEC) Continuing Professional Education, 45 hours of Texas Environmental Education Advisory Committee (TEEAC) credit, Professional Development Appraisal System (PDAS) hours, as described in Links I and II. Gifted/Talented credit through your district is available. Registration per person, including all teaching materials and instruction, food, lodging, and transportation during the workshop is only $250. Phase II of TCI will be held in 2017 for those have completed Phase I. Inquiry and Field Investigations in the Forest is a comprehensive look at East Texas forest ecology with some of the best foresters, anthropologists, soil scientists, wildlife biologists and education experts in Texas. Graduates of Phase I will be able to participate in field investigations in water quality, best management practices, vegetation surveys, special wildlife management areas and an in-depth look at cultural impacts on the forest. To register for TCI or for more information, please call 1-866-TX TREES or email us at educationintexas@texasforestry.org. Please include your name, complete mailing address and the grade level you teach.